MOSCOW, June 26. /TASS/. Russian female team has claimed a victory at the World Team Chess Championships in Russia’s Khanty Mansiysk after Alexandra Kosteniuk played a draw with Ukraine’s Anna Ushenina. Before the final round of the tournament, Russia led the championships by four points ahead of Ukraine. In order to win the tournament, the team needed to play at least one draw against Ukraine. Eventually, Kosteniuk managed to achieve this goal securing the team’s title. Russia’s women have for the first time in history won the World Team Chess Championships. However, the Russian women’s team won medals at all the five previous tournaments, gaining silver in 2007, 2009, 2011 and 2015, and bronze in 2013. 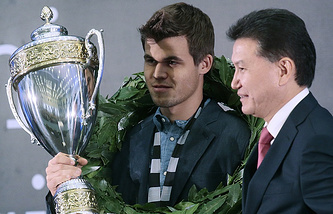 The World Team Chess Championships is concluding on Monday.